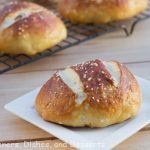 Pretzel Rolls – turn homemade pretzels into dinner rolls! 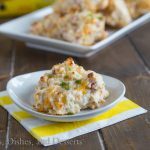 Great for a side dish or use as a bun for hamburgers or sandwiches. Real life, means I have to have a meal plan ready for the week. Last week it included these pretzel rolls, they might have to be made again soon. 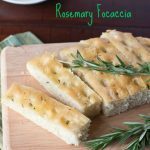 This recipe has been floating around Pinterest for awhile. When I made Beer Cheese Soup, I knew these would pair perfectly with it. A big soft pretzel with a cheddar soup? Kind of a no brainer! The whole family loved them. I was a little nervous for my husbands reaction, because they are a little outside the box. But he loved them. He kind of hoarded them and made sure there were enough for each bowl of soup he was having leftover. Plus, they were surprisingly easy! 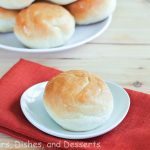 Pretzel rolls are great for a side dish with out, but I also use them as hamburger buns sometimes! Or shape them into longer pieces, and you can have a hot dog or brat bun. Pretzel buns will definitely impress at your next barbecue. 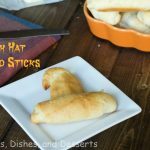 Pretzel Rolls - turn homemade pretzels into dinner rolls! 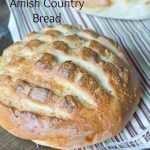 Great for a side dish or use as a bun for hamburgers or sandwiches. Combine water, yeast, and sugar in the bowl of an electric mixer. Let rest 5-10 minutes until foamy. Add flour, salt, and butter. Using the dough hook attachment, mix until well combined. Remove bowl from mixer, cover with towe. and let rise for about and hour, or until doubled in size. Punch down and turn onto floured surface. Cut the dough into 8 pieces. To shape the dough "take a piece of dough and start forming a round, smooth ball by pulling the sides to the center and pinching to seal. 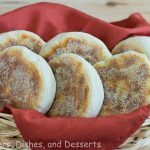 Place, pinched side down, on a counter and lightly cupping your hand around the dough ball, rotate your hand in small circles lightly rolling the ball around the palm of your hand." Place the ball on a lined baking sheet pinched seam side down, with at least 1” between each roll. Cover with a towel and let rest for 30 minutes. Preheat oven to 425 degrees. In a large saucepan, bring 2 quarts of water to a boil. Slowly add the baking soda reduce heat to low. Place 2-3 of the rolls at a time in water, seam side down. Cook for 30 seconds, turn roll over, and cook for another 30 seconds. Remove, draining the water. Place back on sheet pan, seam side down. Repeat boiling the dough with the remaining rolls. Brush each roll with the beaten egg, then sprinkle with pretzel salt. Using a sharp knife, 2 slash marks in the top of each roll. Bake for 15-20 minutes, until golden brown. Serve immediately. nice! i really love your simply work. this is perfect for my breads craving hahas! These are so fun! They would go so well with a big seafood feast or pot of chili. Great recipe, Erin! I just told my husband that I want to make homemade pretzels. 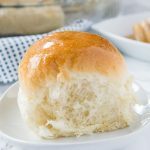 These rolls look fabulous! great look rolls, I will have to try this recipe out soon. 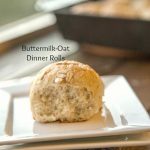 these rolls look delicious – I would not be safe around them!! 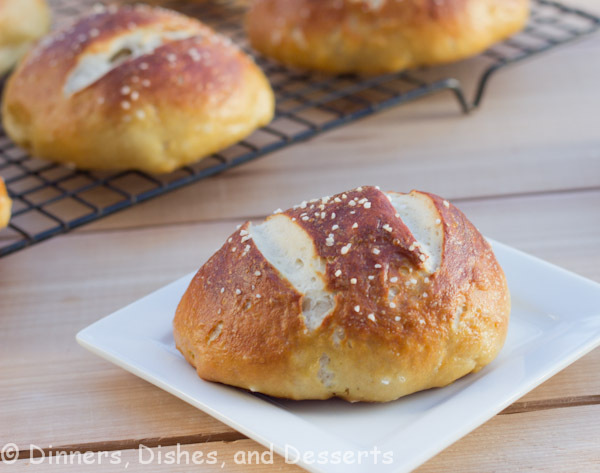 I’ve been wanting to make pretzel rolls for a while…these look absolutely perfect! I love pretzel rolls! I bet these would be great with cheese soup yum. I love pretzels and I love bread, this is a perfect roll. 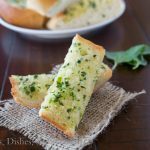 I’m bookmarking this recipe!! Erin this is the cutest pretzel rolls ever! This bread with beer cheese soup? That’s something I’m totally missing in my life!!! So these are my BF’s favorite but I haven’t faced the dreaded yeast since high school! It never worked for me…but when I’ve mustered up enough confidence to give it a go it may have to be for these beauties! yum, these look amazing, erin! definitely will have to give these a try soon! 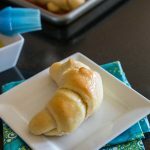 I love soft pretzels but have never made my own – these rolls look amazing! These rolls some cheese dip and I am in heaven!!!! Yum, these look super delicious! 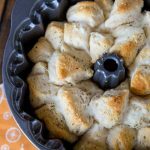 Love them – soft pretzels are one of my favs, and bet it’s amazing as a roll so you can make it into a sandwich! Mmm those pretzel rolls look fantastic and delicious! I love soft pretzels. These rolls look amazing! I love the pretzel idea in a roll. How ingenious. these.look.amazing!!!! i would love a big pretzel roll with some soup on this cloudy day! i’ve actually NEVER had a pretzel roll but you make it sound very easy to make Erin! I’ve been wanting to make these for a while. They look amazing! These look phenomenal! 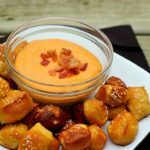 I love soft pretzels and this is a winner in my book! Thanks for sharing, Erin!